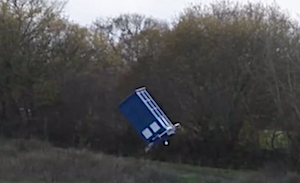 Doctor Who fans made their own life-size Tardis. It takes off, flies above the countryside and it lands. Just like the Doctor, the fans may not always be in full control of the Tardis. The inevitable crash was caught on camera, of course!